DJ Bakken, a member of the Board of Directors, connected The Fuller Center to another nonprofit organization, City Lights Ministries. City Lights operates a community transformation project in Bellanton, Haiti. Bakken and Jacob Battle, another board member, joined a City Lights team of volunteers that built two homes April 12-23 as part of the Bellanton Transformation Project (learn more here). 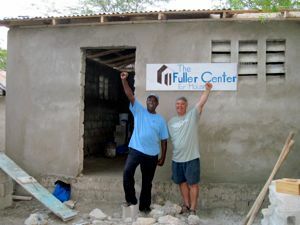 "By the help of the Lord, The Fuller Center is on the ground in Haiti and we were able to build two houses in one week," Battle reported. The homes were for a family of eight and a family of 11–neither of whom have income. "They live off of what they can find walking up and down the road–if they can find someone to give them something to do in a field," Battle said. "They can barely live from day to day." Housing continues to be foremost in the effort to rebuild as Haiti moves deeper into the rainy season. Each family spent time helping build their new home alongside the group of volunteers who came from Minnesota with City Lights. "They have a desire to take care of their families but they don’t have jobs," Battle said. "They have dreams. They have desires. And we can help fulfill those dreams and desires." "Haiti is a country of great sadness. There’s terrible destruction and poverty there. But we’re excited about the opportunity for bringing some hope to the people of Haiti," David Snell, president of The Fuller Center, said. "A decent place to live provides families with a decent place to be nurtured, a decent place to grow." The next step will be shipping materials into Haiti so that building can begin. To stay up to date, follow progress on our Haiti page. Donate to the project now!